A few months later the tsar went to war and had to part with his beloved wife. While he was at war his wife, the queen, gave birth to his son. A rider was sent to the tsar to convey the good news. However, the two sisters and a friend named Barbarikha were so jealous of their sister's luck that they kidnapped the rider and replaced him with their own messenger who carried a note to the tsar which read: "your wife, the queen, has borne neither a son nor daughter, neither a mouse nor a frog, but had given birth to an unknown little creature." When the ship arrived at the Tsar Saltan's kingdom, the tsar greeted the merchant sailors and asked them to tell of the lands they had seen. The sailors told the tsar about the island and the walled city, and spoke of the hospitable Prince Gvidon. The tsar did not know that this Prince Gvidon was his son, but expressed a wish to see this beautiful city anyway. The two sisters and the old Barbarikha did not want to let him go, however, and acted as if there were nothing to marvel at in the sailors' tale. "What is really amazing," they said, "is a squirrel that sits under a fir tree, cracking golden nuts containing kernels of pure emerald, and singing a song. That's something which is truly extraordinary!" Some time later, a second ship came to the island en route to the tsar and the prince again told the swan that he wished to see his father again. This time, the swan turned the prince into a fly so that he could hide in a crack of the ship. After the vessel arrived in the kingdom, the sailors told Tsar Saltan about the wondrous squirrel they had seen. Saltan again wanted to visit this fabled city but was talked out of it when the two sisters and Barbarikha ridiculed the sailors' story and spoke themselves of a greater wonder - of thirty-three handsome young knights, led by old Chernomor, rising from out of the raging sea. The fly, Gvidon, became quite angry with the women and stung Barbarikha's left eye before flying back to the island. The tsar marveled at this and wanted to see this extraordinary land, but once again was talked out of it by the two sisters and old Barbarikha. They belittled the sailors' tale and said that what was really amazing was that beyond the seas lived a princess so stunning that you couldn't take your eyes off of her. "The light of day pales against her beauty, the darkness of night is lit up by it. When she speaks it is like the murmur of a tranquil brook. A half moon is sparkling on her plait, and a bright star is shining on her forehead. Now that's a marvel!" they said. Gvidon, the bumblebee, got angry at the women once more and stung Barbarikha on her nose. They tried to catch him, but to no avail. He was safely on his journey back home. 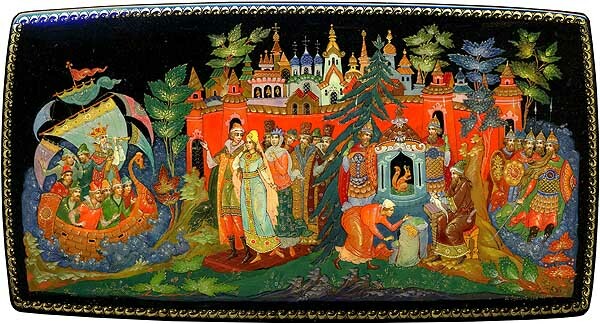 When the ship arrived at the kingdom of Tsar Saltan, the sailors again told the tsar of the fantastic island they had seen, of the singing squirrel cracking the golden nuts, of the thirty-three armored knights rising out of the sea, and of the lovely princess whose beauty was beyond compare. This time the tsar would not listen to the snide remarks of the sisters and Barbarikha. He called his fleet and set sail for the island immediately. When he reached the island, Prince Gvidon was there to meet the tsar. Saying nothing, Gvidon led him, along with his two sisters-in-law and Barbarikha, to the palace. Along the way, the tsar saw everything that he had heard so much about. There at the gates were the thirty-three knights and old Chernomor standing guard. There in the courtyard was the remarkable squirrel, singing a song and gnawing on a golden nut. There in the garden was the beautiful princess, Gvidon's wife. And then the tsar saw something unexpected: there standing next to the princess was Gvidon's mother, the tsar's long-lost wife. The tsar recognized her immediately. With tears streaming down his cheeks, he rushed to embrace her, and years of heartache were now forgotten. He then realized that Prince Gvidon was his son, and the two threw their arms around each other as well. A merry feast was held. The two sisters and Barbarikha hid in shame, but eventually they were found. They burst into tears, confessing everything. But the tsar was so happy that he let them all go. The tsar and the queen and Prince Gvidon and the princess lived the rest of their days in happiness.